If you are adding essential oils to your meditation or home yoga practice, there is a little research to be done. The first thing you need to do is figure out which essential oils you want to use (check out our article on the best essential oils for meditation to get started). Then you need to figure out how you want to use them. For most people, using an essential oil diffuser will meet their needs. Generally, they disperse the scent of the essential oils in the air so you can benefit from their calming and grounding properties while you meditate. Because everyone’s needs are different, there is no single diffuser that works for everyone. That’s why for this article we looked at several of the best essential oil diffusers for meditation. When you consider buying an essential oil diffuser you’ll need to take into account several different factors. The biggest one is how you want the aromatherapy to be delivered to you. Different diffusers either use heat, water, or air movement to disperse the aromas. Another important factor to consider when selecting an essential oil diffuser is where you meditate. If you have a dedicated space in your home for meditation then a steam diffuser or candle diffuser may work well. If you meditate outside the home (like at the office or while traveling) or in a shared space, a personal diffuser like jewelry may be a better choice. All of these factors depend on your personal preferences and your meditation needs. Because of this, the best essential oil diffuser for your may be different than the one that would be best for someone else. We looked at each type to find the best essential oil diffusers and highlight their pros and cons to help you pick the best one for your meditation practice. When you break each diffuser down to their function, there are four essential oil diffuser types: nebulizing diffusers, humidifying or ultrasonic diffusers, evaporative diffusers, and heat diffusers. We’re going to look at the best essential oil diffusers in each category so you can select the style and features that work best for you. An essential oil nebulizer is considered one of the best types for aromatherapy. This is because it does not rely on water to disperse the essential oils, basically diluting them and their effects. They also do not use heat which can alter the chemical make up and effectiveness of the oil you’re using to meditate. They are great essential oil diffusers for large rooms or even just a small meditation space as they are very efficient at spreading the scent of the oil for aromatherapy or even just to replace candles. Nebulizers tend to be more expensive than other types of essential oil diffusers, but if you’re using pure essential oils regularly most people consider it to be worth the investment. 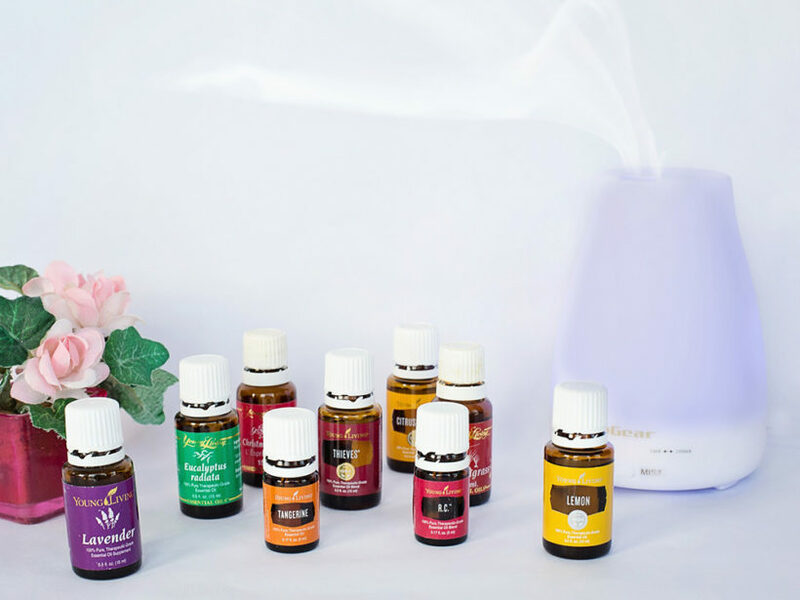 Depending on the design of the nebulizer, you will either attach the bottle of essential oil to the diffuser directly or use a dropper to add a small amount of oil. Beyond that, you only need to plug the essential oil nebulizer in and it will begin to disperse the oils. If you’re interested in this type of diffuser, check out some of our recommended essential oil nebulizers below. If you’re looking for one of the best essential oil diffusers, check this nebulizer out. It’s not only a gorgeous device made of glass and wood but an efficient and long-lasting nebulizer as well. It goes well in any home, meditation space, massage room, or yoga studio. It also features a LED light that displays a calming rainbow of colors which can be turned on and off with a simple touch sensor. It also has a built-in auto-off setting to shut off after 2 hours (great for forgetful folks). There are a few downsides with this nebulizer. It needs to be cleaned regularly using alcohol to clear the glass tubes of any essential oil build up. The manufacturer recommends weekly cleanings for most users, but if you use thicker essential oils you may need to clean it more frequently. The price is also higher than many steam diffusers on the market, so those new to aromatherapy and using essential oils for meditation may not want to start with this model. Based on the reviews and customer feedback, the Radiance is the best essential oil nebulizer for sale online. This nebulizer is available with a dark brown wood base or a light base, depending on which will better match your decor. Made in the USA from sustainable hardwoods and hand blown glass. Comes with a one year warranty. If you want nebulizing diffusion with a more modern style, you may be interest in the Raindrop Nebulizer. This nebulizing diffuser is great for medium and large rooms as it can disperse the aromatherapy in areas up to 800 square feet. This is a gorgeous device made from wood and handblown glass that will easily fit with the decor of your home or meditation room. Since this is a nebulizer, it releases pure essential oil that is not diluted or altered by heat or water. The unit has built-in volume control to adjust the amount of essential oil diffused into the room. It automatically runs for 2 hours and then shuts off so you don’t have to worry about remembering to turn the Raindrop diffuser off. Other features include option LED mood lighting that can be a great addition to a meditation space. If you want to understand exactly how the nebulizer works to disperse your essential oils, click through to the Amazon listing to see a detailed diagram of all the components of the Raindrop diffuser. Available in two colors: black wood base and light brown wood base. One year warranty. The main difference between ultrasonic diffusers and essential oil nebulizers is that ultrasonic and humidifying diffusers use water. The water is released as steam with the essential oil, which has the effect of slightly diluting the oil’s potency. However, you still get the beneficial effects of the oil and also the plus side that it helps humidify the room you’re in (which is great in the winter). Humidifying essential oil diffusers have become very common in recent years so there are many different models to choose from at very affordable prices. There are a lot of different styles and features as well, so you can really shop around to find something that matches your decor and style. This is the type of essential oil diffuser that we recommend for beginners as it has a low initial cost investment and the units are very easy to use. Ultrasonic diffusers are great for meditators or casual home use for aromatherapy and even just as an aromatic air freshener. This is one of the most popular ultrasonic diffusers available on Amazon right now and one of the most affordable. The InnoGear works by using water and your favorite essential oil to diffuse the scents into the room. This ultrasonic diffuser holds about 100 ml of water and can efficiently work in small and medium sized rooms. You can use one of two diffusion modes: an intermittent mist (runs for 6 hours) or a continuous mist (runs for 3 hours). The unit automatically shuts off when all of the water is used to prevent overheating or damage. The InnoGear humidifying diffuser has 7 changing mood lights that can be used with or without the oil diffusion. That makes this unit great for a children’s bedroom as it can double as a nightlight. It can rotate through the colors or stay steady on your favorite light. A lot of people use it at night to help humidify their bedroom air with calming essential oils that aid their sleep. It’s also very silent, so it won’t disturb sleep or meditation. This ultrasonic diffuser also makes a great addition to any meditation space. The big pros for the InnoGear ate the rotating light, affordable price point, and ease of use. It also doubles as a humidifier. Some possible cons (depending on your needs) is that it works off AC power, so it’s not very portable and is really best to be used at home. One thing to note: this humidifier will only work with natural essential oils–chemical essential oils are corrosive and will damage the unit over time. If you want a more elegant look to your essential oil diffuser and don’t mind spending a little more money, check out this ultrasonic humidifier from OliveTech. It has a beautiful wood grain design in a flower vase shape that looks elegant on a side table, shelf, or on your altar in your meditation space. The OliveTech has some great features including rotating LED lights and quiet ultrasonic diffusion. It works well for aromatherapy while you sleep or using essential oils for meditation. If you’re looking for an essential oil diffuser with a timer, this is a great option. It has 4 timer options: continuous mist, 1 hour, 3 hours, or 6 hours. That makes this a “set it and forget it” humidifier. You can also select between a strong or weak mist depending on how much diffusion you want. This unit also has a higher water capacity than other ultrasonic models, holding 400 ml of water allowing up to 12 hours of continuous aromatherapy output. It also features an auto shut-off mode to protect the humidifier if you run out of water. This is a great option for home diffusion as the unit does use a power cord and is not super portable. Evaporative diffusers are some of the cheapest and easiest used options for aromatherapy and using essential oils for meditation. As you may guess, they rely on evaporation to diffuse the essential oils into the air. There are many different designs to achieve this, but a common one uses some sort of filter or sponge that absorbs the oils. Air movement then disperse them into the room, sometimes via a fan. This is one of the most well know and best reviewed evaporative essential oil diffusers on the market. This easy to use diffuser has a built in fan that disperse your chosen aromatherapy scents. All you need to do is add a few drops of your favorite essential oil to the fragrance pad and turn it on. The fan blows the fragrance throughout the room. The Fan Fuser is a great choice for home use and perfect for a meditation space as it can work well in spaces up to 500 square feet. Since this diffuser relies on evaporation, there is no water to dilute your essential oils and no heat to degrade the oils. The Fan Fuser is a great option to get the beneficial effects of aromatherapy in any room. Some reviewers do say this diffuser requires using more oil than other types and you will need to buy replacement pads over time. If you’re interested in evaporative essential oil diffusion all day long, no matter where you are, these necklaces might be perfect for you. These aromatherapy necklaces let you create a personal sanctuary anywhere, with the scents of your oils dispersed whenever you move. These are great if you want to bring some calm to your work day at the office or even steal a moment or two of meditation on your break. The aromatherapy lockets come in several different designs, featuring a stainless steel pendant that opens so you can insert a sponge. All you have to do is add a few drops of essential oil to the sponge and experience the calming and grounding effects all day. The oil sponges are available in a variety of colors to match your outfit or your mood. Reviewers are pleased with the ability of these aromatherapy necklaces to deliver the essential oils they need all day without the need to fill an entire room or disturbing a coworker. Essential oil diffuser necklaces and jewelry are also great for when you’re traveling, helping you to create a little bubble of calm at the airport or even on an airplane. Another easy to use option, heat essential oil diffusers disperse the scent into the room by warming it. Usually, your choices are either an electronic essential oil warmer or one that utilizes a candle to warm the oil. Some users consider heat diffusers to be a poor choice because the heat can alter the chemical composition of the oil and change the effectiveness of the aromatherapy. Some of the pros for heat diffusers are the cheap price point and how quiet they are (most are completely silent). Cons, besides the heat’s effect on the oil, include the recurring cost of candles or batteries depending on the model you buy. An affordable and cute diffuser option is this ceramic tea light essential oil warmer. The beautiful white holder features flower designs and has a little nook for your tea light. Your favorite essential oils go in the bowl at the top along with a spoon-full of water. The candle heats the oil and disperses the scents throughout your room. This is a great option for a meditation space or a bedroom. The candle light adds an extra calming effect that will enhance your meditation. Usually, tea lights can burn for about 2.5 hours. A few of the cons of this type of essential oil warmer is that some of the potency of your oils may be altered by the heat and the water. You will also need to buy tea light candles as they will burn out over time, but they are pretty affordable. If you’re looking for an oil warmer for your meditation space, you may love this one. This porcelain essential oil warmer is the Buddha’s head, with eyes closed in meditation. This warmer is about 5.5 inches tall, making it the perfect size for a meditation alter, a table, or even displaying on a shelf. There is a nook in the back of the Buddha’s neck that you put the tea light in. The top of his head comes off and reveals a bowl for the essential oils. The candle will give you a little more than two hours of oil warming. One of the great things about this oil warmer is that it looks like a statue or a figurine so it blends nicely with your decor whether or not you’re using it. If you want to bring the benefit of aromatherapy with you outside your home or help find some calm while you commute or even steal moments of meditation at the office, you will need a more portable essential oil diffuser than the ones we’ve already reviewed. These diffusers are great to use on the go and can help you benefit from the grounding and relaxing effects of aromatherapy anywhere. Bring some serenity and calming aromatherapy to your commute with this 2 in 1 aromatherapy diffuser and humidifier for cars. This is an ultrasonic diffuser that uses water to deliver the essential oils via steam. You fill the reservoir with water and a few drops of your chosen scent and then plug it into your car’s cigarette lighter. It fits perfectly in your car’s cupholder and delivers consistent aromatherapy via either low or high mist level settings. This diffuser also comes with a regular home plug-in adapter so you can use at home or at the office, making it a great versatile investment. It’s also good for travellers and bring aromatherapy to your hotel room. This is a great option for people who find driving stressful or want a way to help ground themselves after work. Many of the essential oils for meditation are great for relieving stress and will help you wind down and enjoy your commute. It’s also perfect to help relieve dry winter air or use when you have a cold. Available in three colors: black, purple, or green. If space is at a premium when it comes to your cupholders or you’re interested in a low maintenance aromatherapy option for your car, check out this diffuser. The Housweety diffuser is a simple clip-on device that uses a sponge to deliver your essential oil through evaporative diffusion. All you need to do is add a couple drops of your favorite oil to the sponge and let your AC disperse the scents throughout your car. This diffuser is super easy to use and very unobtrusive in your car. Unfortunately, the design means it can only be used as a car essential oil diffuser. The design features a beautiful stainless steel tree of life and multiple colors of cotton pads to match your car or your mood. If you don’t like the “tree of life” design, the manufacturer makes a ton of other fashionable, contemporary, and fun designs. It’s great to use with calming oils to help destress during a commute or with energizing oils to help you stay alert when driving at night or on a long road trip. If you’re a traveller or often on the go, you’re probably interested in a portable essential oil diffuser. The SpRoom Aromafier diffuser is a great option for a portable and compact diffuser. This evaporative essential oil diffuser uses a cotton pad and a silent fan to disperse the scent throughout the room. It’s perfect for aromatherapy in small spaces like a meditation room, office work station, hotel room, or car. The Aromafier’s compact size (as big as the palm of your hand) is perfect for travelers to toss in their carry-on bag. The Aromafier can run from 2 AA batteries or it comes with a USB cable to plug into your computer or a wall adapter. This is a great option to use essential oils for meditation while you travel, at work, or even in your car. Because of this diffuser’s versatility, I recommend it for all meditators as an all around great diffuser. Find a moment of calm anywhere with the Aromafier. Available in multiple colors to match your decor or style. Now that you’ve found the best essential oil diffusers, it’s time to pick some oils to use in them. We have recommendations for the best essential oils for meditation and for . These are oils that help calm you, fight stress, relieve anxiety, and are very grounding. They will enhance your meditation and help you relax and let go.